"I was confused and I didn't know what had happened, and if anything had, I knew it was my fault." "I was shaken, scared, and afraid of getting into trouble. I was afraid I wouldn't be believed." BACK IN THE STREETS A sign from the 2017 Women's March in SLO. On Sept. 26, the march's organizers held a rally in support of sexual assault victims, many of whom do not report their attacks. Those are just a few of the reasons that local women said they chose not report their rapes and sexual assaults. The stories, several of them anonymous, began pouring into the email and social media accounts of Women's March SLO organizers as they prepared to host a rally in support of sexual assault survivors in downtown SLO on Sept. 26. 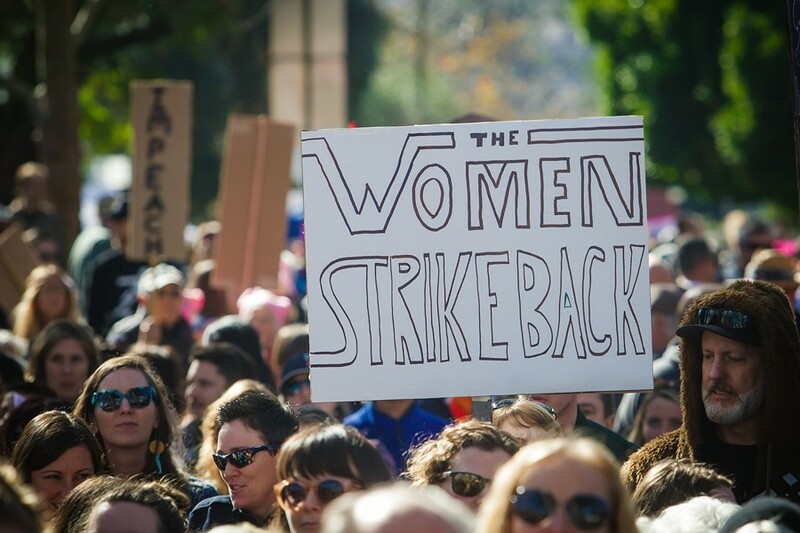 "The stories are devastating, but they show the truth of just how many people are effected by this," Women's March SLO co-organizer Andrea Chmelik told New Times. "We seem to all know someone whose been through a sexual assault or harassment and didn't report it because they were scared that they wouldn't be believed." The rally, held at the SLO County Courthouse, occurred one day before Palo Alto University Professor Dr. Christine Blasey Ford was set to testify before the Senate Judiciary Committee about her allegations against U.S. Supreme Court nominee Brett Kavanaugh, who she said sexually assaulted her at a house party in 1982 when the two were teenagers. Kavanaugh has denied the allegations. Chmelik said the idea for the rally came after President Donald Trump called Blasey Ford's accusations into question, Tweeting, "If the attack on Dr. Ford was as bad as she says, charges would have been immediately filed." "We wanted to show up and say that we believe these people," Chmelik said. "We believe women and survivors, and they have our support." Chmelik said the group began to ask survivors who didn't report their assaults to share their stories, similar to the viral Twitter hashtag, #whyIdidntreport. The responses "came flowing in," she said. At the rally, organizers provided survivors with the opportunity to write their stories down. Those were collected and will be posted on the Women's March SLO's website and social media page. "If you haven't gone through this experience, it's not as easy to understand what happens to these people," Chmelik said. "But when you can see that it's your neighbors, your kids' teachers, your friends, it really hits home."